Above is the starting position of one of the most popular openings in chess, the Ruy Lopez. Named for Ruy López de Segura, a 16th-century Spanish bishop, the position is reached by playing the moves 1. e4 e5 2. Nf3 Nc6 3. Bb5. From here, there are a number of possible variations. The Berlin Defense is reached if Black plays Nf6 on his third move. It gained a great deal of popularity after chess grandmaster and former world champion, Vladimir Kramnik, used it in his victory over chess legend Garry Kasparov in their match for the 2000 World Championship. 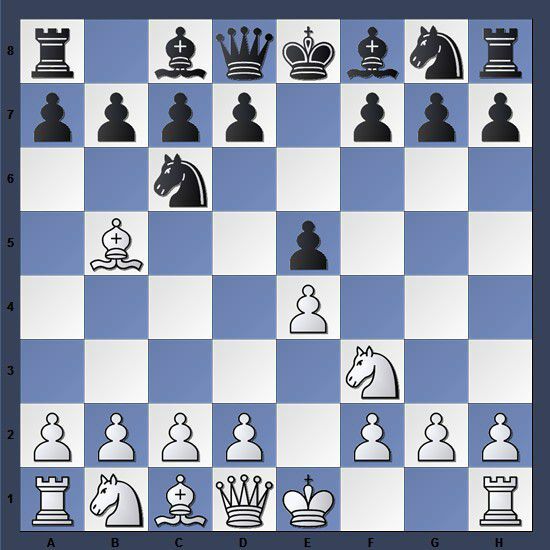 Known for being very solid, the Berlin Defense is often used as a weapon for drawing as Black by strong players who are familiar with the key lines. The Steinitz Defense ​(3...a6) was popularized by the first world champion, Wilhelm Steinitz. While it is solid, it leaves Black with a passive position, making it an unpopular defense in modern play. The Bird Defense (3. ... Nd4) is an offbeat try for Black that can sometimes surprise an unprepared White player. However, after 4. Nxd4 exd4, White will usually emerge with a small advantage due to having the better pawn structure. The Schliemann Defense (3 ... f5) is a popular try for Black in the amateur ranks. This gambit leads to wild positions in which White must know certain theoretical lines to escape with an advantage. Conversely, an unprepared White player will struggle to navigate the challenges posed by Black. White's best response is 4. Nc3, but Black certainly has many ways to create an interesting and tactical game. At higher levels, where White is more likely to be prepared, the Schliemann Defense is used only rarely as a surprise weapon. This opening is also known as the Jaenisch Gambit. The Morphy Defense (3. ... a6) is by far Black's most popular third move in the Ruy Lopez. It immediately puts the question to White's bishop, and after 4. Ba4, Black may choose to break the pin on his knight by playing b5. There are several common variations that arise from the Morphy Defense, some of which follow. While White's most popular 4th move is to retreat the bishop to a4, 4. Bxc6 is also common. Black will usually recapture with the d-pawn, although it is also possible to do so with the b-pawn. The Exchange Variation was popularized most recently by American chess legend Bobby Fischer. White damages Black's pawn structure, and will usually try to trade pieces to get into a favorable endgame. However, despite its reputation, some lines of the exchange variation also allow for middlegame attacking chances. The Closed Ruy Lopez (beginning with 4. Ba4 Nf6 5.0-0 Be7) is a popular system at all levels, and offers a variety of plans for both sides. It is extremely flexible for Black; both players will have a complex game. The main line continues ​6. Re1 b5 7. Bb3 d6 8. c3 0-0. The Open Variation (4. Ba4 Nf6 5. 0-0 Nxe4) is not quite as popular as the Closed Ruy Lopez, but it does have its adherents. Black typically does not intend to hold onto his extra pawn, but rather improve his position while While spends time regaining the lost material. There are numerous complex sub-variations available for both sides, some of which have been analyzed beyond the 20th move for each player. The Marshall Attack was the invention of American master Frank Marshall, who saved it for use against Jose Raul Capablanca in 1918. While Capablanca refuted it over the board and won that game, further refinements to the opening have turned it into one of Black's most feared weapons in the Ruy Lopez. The Marshall Attack is reached after 4. Ba4 Nf6 5. 0-0 Be7 6. Re1 b5 7. Bb3 0-0 8. c3 d5. It features many forcing moves that require players to know theory to successfully navigate the opening, and because of this, many White players choose to play "anti-Marshall" systems that avoid these lines. There are also some lines in which White may force early draws. It should be clear now just how complex the Ruy Lopez can be – and we've only scratched the surface of the lines available in this rich opening system.